Commissioner Porro (front center) with New Economy Project and friends. 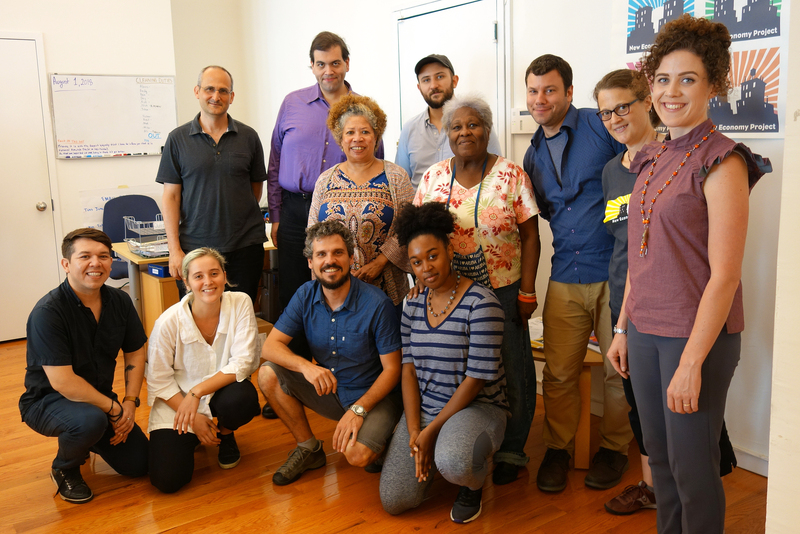 On August 3, 2018, nearly two dozen people from NYC community organizing and cooperative development organizations packed into our conference room for an engaging lunch discussion with Álvaro Porro, Social Economy Commissioner for the City of Barcelona. 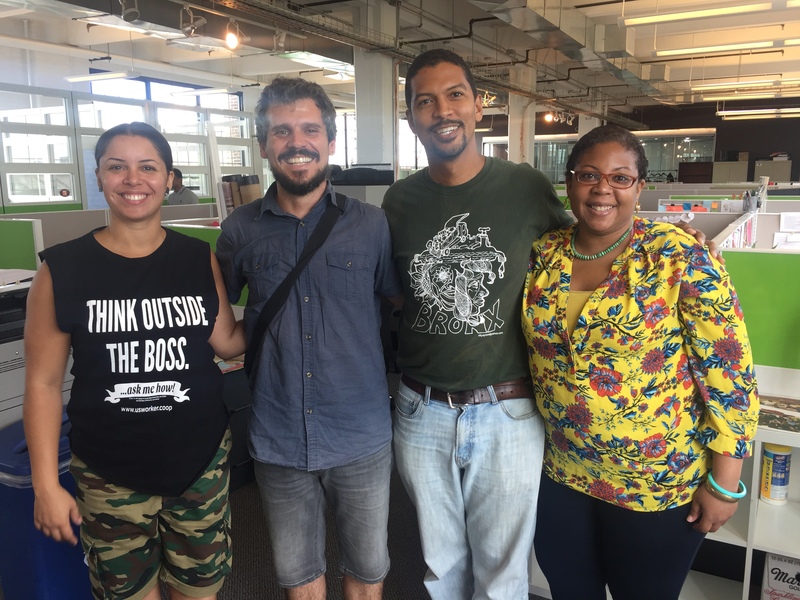 Commissioner Porro was in NYC to speak at the Fearless Cities conference, and earlier in the week we had organized visits for him with The Point CDC and Green Worker Cooperatives, in the South Bronx. Barcelona’s story presents a powerful model for New York City, and we were eager for this extended opportunity to hear about his work. At the lunch, Commissioner Porro described how the Commission for Social Economy, Local Development, and Consumption was created in 2015, after the historic election of Barcelona en Comu activist Ada Colau as Barcelona Mayor, and how the Commission reflects a “people and planet first” approach to economic development. The Commission is charged with supporting the expansion of Barcelona’s Social and Solidarity Economy — a mix of cooperatives, non-profit businesses, and other institutions oriented toward community needs and shared wealth (what we often refer to as the Cooperative Economy). 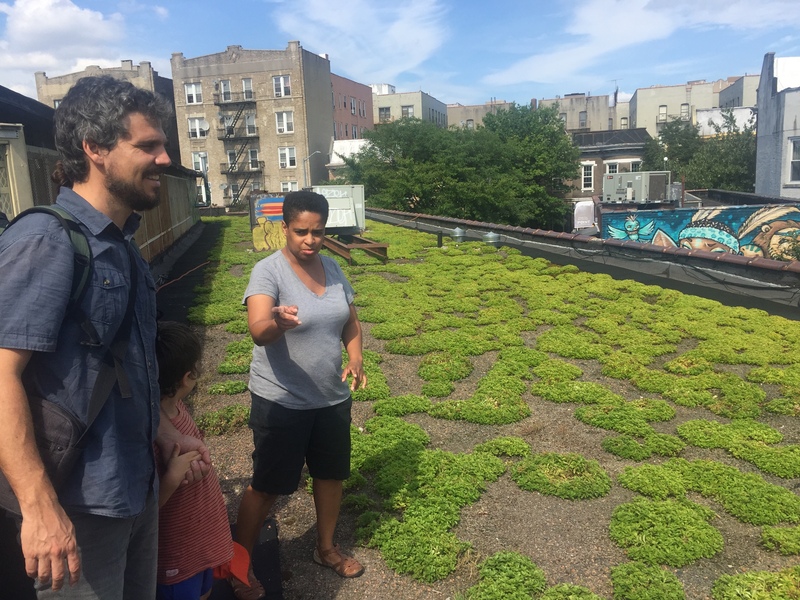 Barcelona Social Economy Commissioner Álvaro Porro tours The Point CDC in The Bronx. Porro explained that the Commission’s first step was to survey the state of the social and solidarity economy in Barcelona. To its surprise, the Commission found that these economic activities accounted for as much as 8% of employment and 7% of GDP, demonstrating their vital role in the local economy. Commissioner Porro stressed the importance of “co-producing” social economy policy with grassroots groups experienced in building local institutions of shared wealth. Once the Commission completed its survey, for example, it started working with leaders and practitioners from various sectors of the social and solidarity economy – including worker-owned businesses, community gardens, and housing co-ops, as well as government agencies – to craft a 31-point plan for promoting and strengthening cooperative economics. According to Porro, the Commission has been using the plan, with continued feedback from practitioners, to drive its work. This has included a wide variety of interventions, including training city officials on cooperative economics, running awareness campaigns, brokering partnerships with educational institutions, providing financing through partnership loans with credit unions and mission-driven banks, and much more. The Commission is even creating a publicly-owned and operated 35,000 square foot cooperative incubator space with in-house support services. This kind of comprehensive and participatory planning approach, as well as the specific types of interventions it’s yielded, map closely to what many groups here in NYC want to see from City Hall. The Barcelona Commission has already had tremendous impact, with a doubling in new co-op creation since it was formed just a few years ago. We were struck by the extent to which the Barcelona Commission is aligned with the vision that New Economy Project and many other groups have for a NYC Office of Cooperative Economics. Commissioner Porro and the team at Green Worker Cooperatives. As we continue our collective work to build an economy rooted in cooperation, equity, social and racial justice, and ecological sustainability, we thank Commissioner Porro for sharing his experience and wisdom. His work, and the work of the Commission, shows what’s possible when a city deeply embraces cooperative economics as transformative economic development strategy.